The skid steer is one of the most versatile and universal machines found on job sites today. Skid steers were first introduced into the dairy farm application when they were first released but have become popular in the construction industry and many others. Now its not uncommon to see these machines being used for mining, demolition, recycling, waste-handling, landscaping, and so much more. Anywhere a small but powerful machine is needed for a project, you will probably find a skid steer in use. Developments in skid steer technology have also led to innovations in skid steer tire technology. Traditionally, skid steers have been outfitted with pneumatic tires (air filled). Over the past 15 years or so, demand for solid skid steer tires has been trending upwards. There are now many options available on the market, but which tire is the superior option? It can be tough to choose between the tried-and-true pneumatic skid steer tires that have been in use for years versus the newer, more technologically advanced solid skid steer tires. Let's examine some differences so you can determine which kind of tire is right for your needs. As the industry standard, pneumatic skid steer tires are the easiest to afford and purchase. When comparing prices for new pneumatic skid steer tires versus new solid skid steer tires, the pneumatic skid steer tires seem like the better value due to the lower up-front cost. The downside is that these tires tend to wear out quickly. They are also more likely to be punctured, so you will need to replace or repair them often. These costs can add up to a huge expense in the long run. Another reason workers might prefer pneumatic skid steer tires is because skid steers are not equipped with suspension, so the ride can be bumpy and rough. Pneumatic skid steer tires help soften the ride by providing shock absorption, resulting in greater comfort for the machine operator. However, this can also be a drawback because the ride can get too bouncy due to the air in the tires, causing loads to shift and resulting in potentially hazardous unstable situations. One of the most appealing things about solid skid steer tires is never having to stop working to deal with the hassle of repairing a flat. In extreme applications such as demolition sites or rock quarries, pneumatic skid steer tires are at high risk for puncture from items like rebar, sharp rocks, or construction debris. Solid skid steer tires provide the ultimate in puncture-resistance, which means less downtime for workers and machines, and fewer repair costs. Though solid skid steer tires are more expensive up front, they last 3 to 5 times longer than pneumatic skid steer tires, which means fewer tires will need to be purchased. This also lowers cost/hour because the machine will be in service for far longer between tire changes. Overall, solid skid steer tires can provide a better return on your investment. One of the biggest complaints about solid skid steer tires is the lack of suspension. Pneumatic skid steer tires are generally considered more friendly on the operator, who can feel battered by the hard ride provided by lower-quality solid skid steer tires. However, advances in rubber technology and solid skid steer tire designs have made this far less of an issue. To Learn More About Solid Skid Steer Tires, Read Our Blog. To Learn More About Comparing Foam Filled Skid Steer Tires to Solid Skid Steer Tires, Read Our Blog. Which Tread is Best for You? Solid Skid steer tires come in a variety of tread types to match the working conditions the skid steer will be used for. Let's take a look at some of the different tread types available so you can decide which fits your application the best. 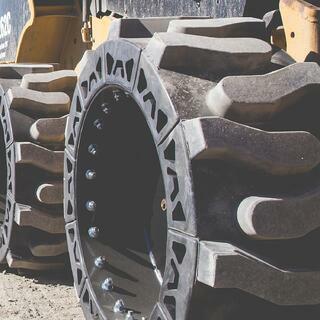 All-Terrain Solid Skid Steer Tire - If the majority of your work is done on dirt, with a little mud or rocks thrown in, then all-terrain solid skid steer tires will suit you best. 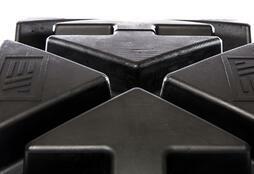 Their tread patterns are designed to give good traction on soft surfaces. 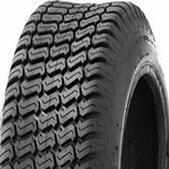 This is the most common type of tread pattern found in the market in solid skid steer tires. A customer needs to keep in mind though that these will wear prematurely if a lot of your work is being done on concrete or pavement. In an all terrain solid skid steer tire you want to look for a tire that avoids using center wear bars in their tread design. While they are needed for structure if the treads are small to prevent tread roll over the center wear bars will reduce traction on your machine once the tire is 50% worn. 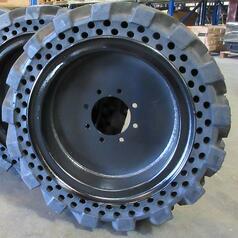 Hard Surface Solid Skid Steer Tire- A lot of extra wear is put on a tire when it is working on hard surfaces. If your job sites consist of asphalt, concrete, or other hard surfaces, then the specialized tread of a hard surface solid skid steer tire will increase the lifespan of your tires while still maintaining some traction. These types of solid tires will typically be more money than an all terrain tire would be but they pay off big in the long run with added wear life. In some cases, you can expect 50%-100% longer wear life. Smooth Solid Skid Steer Tires - When even greater wear protection is required and traction isn’t a concern, smooth tread tires answer the call. The smooth tread of these tires maximizes the rubber contact to the ground and disperses the load over a greater area, resulting in longer tire life. Mud Solid Skid Steer Tires - Mud is an especially soft surface to have to drive in and as such can make it very difficult to maintain traction. Tires designed for use in the mud have extra deep treads to help grip into the mud and increase traction. They will also have large void spaces in and around the tire lugs so material cleans out quickly. These tires though will wear quickly in hard surface applications. 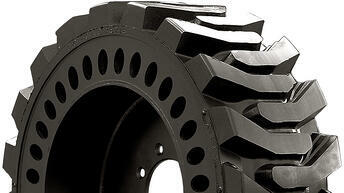 Turf Skid Steer Tire – Landscaping and municipal work is a common use for skid steers. When driving frequently over meticulously manicured lawns and grass surfaces, you'll want to minimize the damage that your vehicle does to them. Turf tires are not very good for other surfaces, but they will help protect grass from the potentially destructive nature of your machine. Solid skid steer tires are a popular tire option on skid steer loaders. This is because skid steers work across a wide range of industries and are needed to do a wide range of tasks even on a single job site. For this reason, solid skid steer tires have gained popularity because the skid steer they are mounted on needs to be a reliable machine and ready to use. Flat tires whether they be from a puncture or broken bead cost money in both downtime and repair costs. Because of the competitive nature of business, companies are always looking at ways to improve the ROI on their machines and jobs. Solid skid steer tires are a solution than can both eliminate flat tires and increase productivity on a job site. 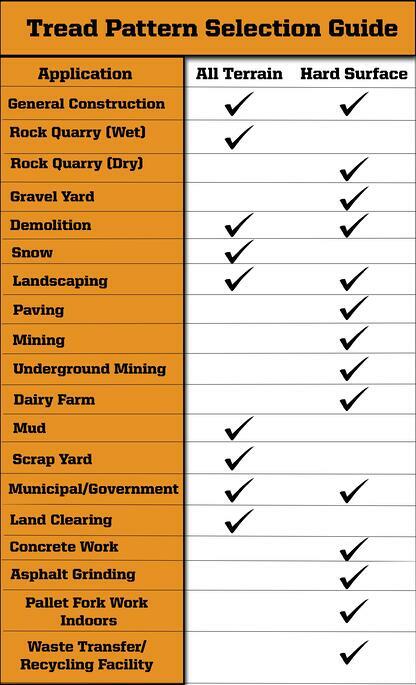 Industries where solid skid steer tires are commonly found are listed below along with the tread type we recommend for that application based on typical working conditions for those industries. To Learn More About Solid Tire Tread Patterns, Read Our Blog. Solid skid steer tires are popular among many skid steer users because of the reduced downtime they provide and the elimination of flat tires. Over the years many different designs have emerged of the aperture hole designs in the sidewall of the tire to provide cushion and make the ride more comfortable for the operator. 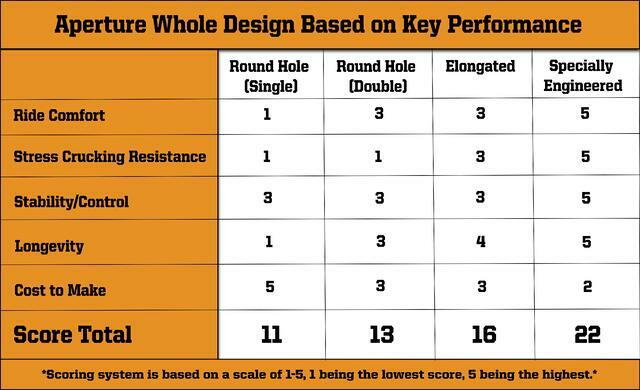 Here we look at the different types of aperture hole designs in a solid skid steer tire as well as the pros and cons of each. The first type of aperture hole design in a solid skid steer tire is the single row basic round hole design. This design is intended to provide a cushioned ride with the solid skid steer tire. However, many operators find that it provides a stiff ride. 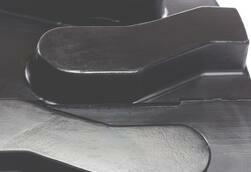 This design is cheaper to make because the overall use of the rubber compound is decreased due to a lower profile. However, with less rubber in these solid skid steer tires, the grip and the cushioning is certainly reduced. There are also certain problems associated with this type of aperture hole design to consider. Round hole solid skid steer tires may suffer from stress cracking over time, because the circular holes often compress to create a specific pinch point under heavy loads. This will end up reducing the load bearing capacity of the tire over time and its useful lifespan. This is a very common type of aperture hole design though on solid skid steer tires because it is less expensive to make and can be sold at a reduced price. You will find that many overseas made tires utilize this design. The elongated holes on solid skid steer tires are just an extended and upgraded version of the rounded holes. They have slightly more rubber used in them, which improves the cushioning when compared to the round-hole solid skid steer tires. These tires are still stiff, when compared to other, better options. The elongated aperture means that the problem of stress cracking is significantly reduced, when compared to the round hole solid skid steer tires, because the oval is intended to compresses to make a circle instead of a pinch point. The rubber profile is also larger, which is intended to increases the overall comfort level, but in reality the ride is still fairly stiff. Having a larger rubber profile also means that these solid skid steer tires are slightly more expensive to manufacture than the round hole version. If you are looking for solid skid steer tires that provide a cushioned ride, staggered aperture hole design tires are better than elongated and simple round hole designs. However, the cushioning does not compare to a pneumatic tire, and operators will still comment on the stiffness of the ride. Additionally, since the holes are round, they will still create pinch points under heavy loads. This can produce stress cracking and over time reduce the load bearing capacity of the solid skid steer tire and the usable wear life of the tire. Specially engineered aperture holes in a solid skid steer tire provide it the same ride and comfort as that of a pneumatic skid steer tire and offer an excellent cushioning effect. This allows the operator to smoothly work on the skid steer, while still moving heavy loads. This type of design is also made to reduce bounce because the aperture design operates like a shock absorbed with the ground. Operators will also comment on the tire being more stable because of the internal cross structure designed into the solid skid steer tire. The aperture holes do not create compress points, which ensures that the tires are resistant to stress cracking. This is also possible with the use of premium rubber compounds that use additives specifically designed to reduce stress cracking. They are present in premium solid skid steer tires and offer excellent traction because of the rotational torque the tire creates from compression of the tire. To Learn More About Types of Aperture Hole Designs for Solid Skid Steer Tires, Read Our Blog. How Are Solid Skid Steer Tires Secured to a Rim? There are different types of solid skid steer tires according to the way they are secured to a rim for installation and use on a skid steer loader. Here, we describe three different types of solid skid steer tires, with each one being installed in a different manner. 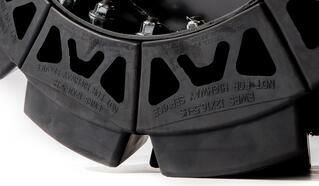 The simplest way solid skid steer tires can be mounted onto a rim is by being pressed on to fit over an existing rim. This is possible with the use of specialized equipment and done at a local tire dealer who has a press capable of doing this. The solid skid steer tire is held to the rim by friction because the tire is slightly stretched so that it can fit onto and over the rim. A solid skid steer tire of this design is typically a lower cost up front, but has certain disadvantages. If the skid steer is pushing hard and the solid skid steer tire is under heavy load the friction fit can fail and the tire will start to spin on the rim. 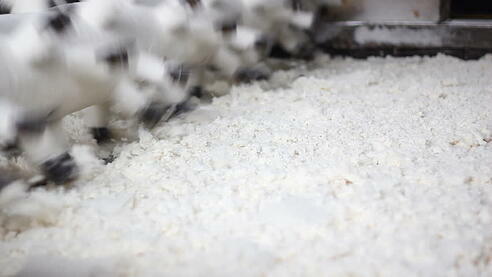 Slippage will typically happen more repeatedly over time as the rubber strength starts to fatigue. Press on solid skid steer tires will also commonly slip when working in wet conditions and heavy loads because water acts as a lubricant between the rubber and the rim. Bonded solid skid steer tires come in a prepared state. These solid skid steer tires are chemically attached to the rim on which they are mounted. Rims are always bought with the tires, since a set of tire and rims cannot be used in a separate manner. This means that customers who want to exercise flexibility may find themselves limited when using bonded solid skid steer tires. The most important advantage of using this type of solid skid steer tire is that they provide protection from slippage between the tire and rim and withstand high torque conditions. This means improved traction when you need it because the tire can’t slip on the rim. They can be a costly purchase though, because you will need to replace the complete tire and rim assembly each time you replace tires on your machine. Segmented solid skid steer tires are the best, when it comes to a reliable bond between the tire and rim, flexible use and serviceability when you need it. 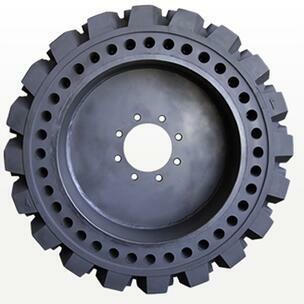 A solid skid steer tire of this type uses a system of nuts and bolts. These bolts are internally installed on different rubber segments present on a solid skid steer tire and then connect it to the rim in use. This means that you can always take these tires off their rims and reuse the rim with a new set of tread segments when the tire is worn and needs to be replaced. This type of system also does not require specialized tooling or presses to retread your tire, any operator can do it themselves with a wrench or ratchet. 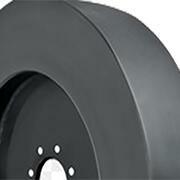 A segmented solid skid steer tire is protected from the problem of slipping on the rim. It is an excellent system which may require you to buy the rims for the first time, but once you have a set of rims, you can simply remove the worn-out segments and then bolt on the new ones, to ensure that your machinery can offer you the best possible productivity on the job site. To Learn More About Types of Mounts for Solid Skid Steer Tires, Read Our Blog. Solid Skid Steer Tire Rubber Compounds – What’s the Difference? Solid skid steer tires are made from special rubber compounds and are not filled with air. They are perfect for use in many commercial applications and are commonly found in mining, rock quarry’s, demolition, waste transfer stations, general construction and anywhere else that flat tires are prevalent. A good quality solid skid steer tire is usually made from high-grade rubber compound ingredients, which are slightly different from normal tire compounds used in typical pneumatic skid steer tires. There are a few differences between ordinary tire materials and the ones that are used to make solid skid steer tires. Here we discuss some important elements that truly describe a high-quality solid skid steer tire. Solid skid steer tires are prepared from a mixture of ingredients that have a much higher proportion of natural rubber. This composition is different from a common tire, which can be prepared using a higher percentage of synthetic rubber compounds. Solid skid steer tires face a lot more wear and tear because they are typically found in more severe environments, natural rubber increases the wear properties of the rubber compound so you get more life out of your solid skid steer tires. Not all natural rubbers are created equal though, many different quality grades are available and as such have a different cost. There is really no way around this, higher quality solid skid steer tires will cost more simply because they cost more to make. 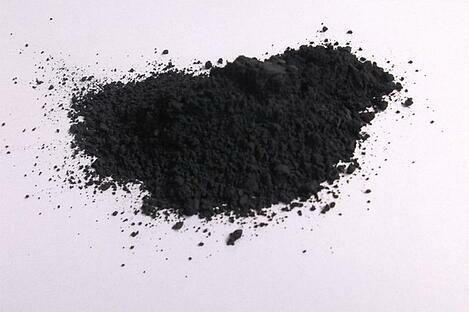 Another key ingredient in the rubber compound solid skid steer tires are made of is carbon black. This ingredient is often overlooked by customers in the industry when purchasing solid skid steer tires because of the importance natural rubber plays. Carbon black is a key ingredient responsible for increasing tire wear life and specifically cut resistance and chunking resistance. 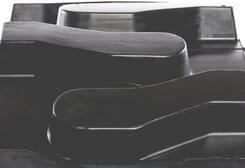 Similar to natural rubber, carbon black comes in a variety of quality grades. If a solid skid steer tire manufacturer is combining a high grade natural rubber with a high grade carbon black the tire cost will be higher but the performance and wear results will be far superior. Some solid skid steer tire companies may mix the high-grade rubber compound ingredients with lower grade ones to keep costs down or not use any high-quality ingredients at all and come up with an inexpensive product. However, this means that as a customer you get a low-quality product which will simply be not up to the task to ensure that you can use it in an industrial application. Common problems associated with a low quality solid skid steer tire product are premature tire wear and chunking issues. You can get solid skid steer tires from around the world, but there is a difference in quality. The tires that you get from countries such as China can never compete with the solid skid steer tires manufactured in North America, because of better working processes, attention to detail and higher quality rubber compound ingredients among other advantages. As a standard rule of thumb solid skid steer tires that come from China, Indonesia and the Asia-Pacific Region will have rubber compound consistency issues and your results with these products will vary. Be sure to ask where a solid skid steer tire is manufactured before you purchase and make sure that’s what it says on the product when you get it. Just because a company is based in North America doesn’t mean the product being sold wasn’t imported from overseas and assembled domestically. A common issue with solid skid steer tires you will hear about is how rough of a ride they are in cold weather. This all comes back to the original rubber compound formula used by the solid skid steer tire manufactures when making their tires. There is an additive that can be added to the rubber compound mixture to prevent/reduce the stiffening of a rubber compound at colder temperatures. This however is an added cost and only a small percentage of manufacturers will have something to reduce stiffening at colder temperatures in their compound. While stiffness in the ride of a tire can become an issue at cold temperatures with a solid skid steer tire rubber compound that is not designed properly, chunking can be another major issue. 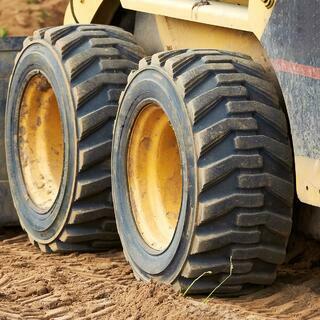 To Learn More About Solid Skid Steer Tire Rubber Compounds, Read Our Blog. Solid Skid Steer tires will range widely in cost based on quality of the product that is being offered, the features built into the tire and where it was made. Typically solid skid steer tires will range from $600-$1200 per tire depending on the features being offered with the tire. The natural tendency for most customers will be to gravitate towards purchasing a cheaper set of tires to save money and keep their costs down. However this may end up costing them more in the long run. 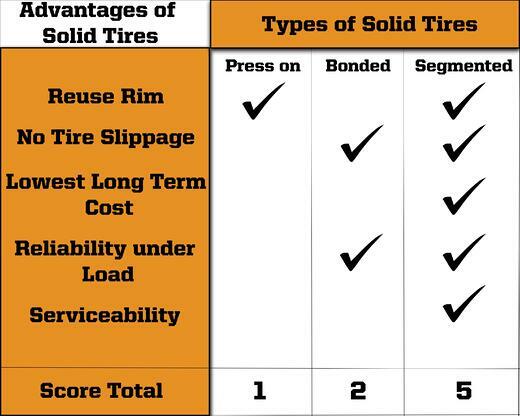 As we demonstrate in the below graphs higher cost solid skid steer tires will typically have a much longer usable wear life. This means that even though the up front cost is higher, the overall cost/hr of a premium solid skid steer tire is lower than a cheaper up front cost tire. Finding a tire with the lowest cost/hr is going to increase your machines ROI and add more money to your bottom line. To conclude, while purchasing a set of cheaper solid skid steer tires may look like a better option on the surface, customers should consider the long term cost of their tire purchases. Make sure you match your tire needs to the solid skid steer tires you decide to purchase and try to make an investment rather than a purchase. 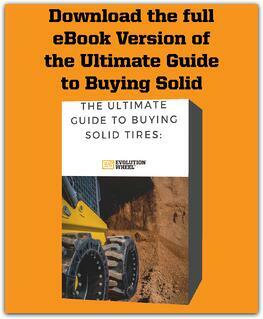 To Learn More About the 5 Top Reasons to Pay More for a Solid Skid Steer Tire, Read Our Blog. Many factors must be taken into consideration before purchasing a set of solid skid steer tires including tread type, aperture hole design, rubber compound quality, where they are made, up front purchase cost and expected wear life. Hopefully this guide has provided you with more information so you can make a better buying decision with your solid skid steer tires purchase. Before you make your purchase decision, make sure you sit down and decide what features and performance attributes are most important to you in a solid skid steer tire. This will help you narrow down your search and help you determine what option is best for you. 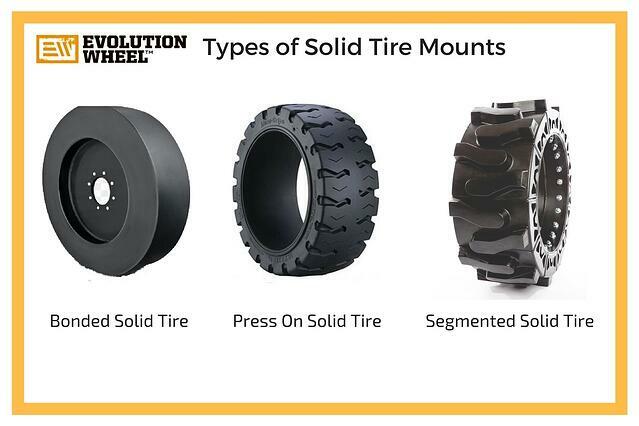 For more information or if you have specific questions about solid skid steer tires before you make your purchase give the experts at Evolution Wheel a call and we will be happy to help. To Learn More About the 5 Top Reasons to Run Solid Skid Steer Tires, Read Our Blog.